Exacep was established three years ago, but it took a lot of hard work to get the company to where it is today with its share of significant challenges along the way. My team and I spent three long years researching and developing the technology we rely on before we officially launched Exacep to the public. The goal right from the beginning was to build a different kind of offsite backup service geared towards medical, dental and business marketplace. One they could feel absolutely confident in and at the same time, make it very simple for small and medium sized businesses to use. After all, our whole reason for being is to protect our clients’ most important electronic data, but we also realized it is a fairly new technology, so making it accessible to the average non-technical person was very important. We appreciate the trust and take our responsibilities very seriously and to date, Exacep has been very successful attracting and retaining clients. We received approval for Scientific Research and Experimental Development from the Canadian Government for achieving technology advancements in the areas of file transfer, security and copying live data in use. Basically the technical terms for data storage and protection. I am thrilled with our progress to this point and we are going to keep pushing ahead until Exacep is the go-to company for online data storage. In answer to your last question, Exacep is currently headquartered in Ontario, Canada. We really hit the ground running and I am very happy to say my day-to-day duties keep me very busy. Every day, I speak with clients and prospective clients to see exactly what they are looking for in an offsite backup company. I believe that success demands being a perpetual student so I always keep learning. It is important in such a competitive and constantly evolving market to keep up-to-date with advances and set yourself apart. We believe in Exacep and I demand a high level of service from my group, and myself each day. We work on product development including improving what we already offer and creating new services that meet our clients’ changing needs. I spend time researching each and every day to see how we can continue to offer a superior product that offers something beneficial to everyone. I think this is what makes us unique and makes us ideal for small and medium businesses. We really are different and offer a flexible product and a level of service that is unmatched in our field. 3/BR: Is your customer base primarily in Canada or the US, or is there a significant international presence as well? Exacep is taking care to offer a good, solid product to the US and Canadian markets but we have plans to expand our client base in the near future. It is about consolidation and then expansion. There has been a mandate by the U.S. Government that all medical records must be paperless by 2012, so we see a real opportunity there. In terms of an international presence, that is definitely a goal for Exacep. 4/BR: Any other news about your company you care to share? In the second quarter of this year, Exacep will release a new technology that is going to increase data transfer speeds substantially and, to be frank, make us one of the most efficient offsite backup services, not only domestically, but internationally as well. It’s exciting and I am sure you’ll hear about it. 5/BR: What is the amount of file you backed up in your servers? Exacep Offsite Backup has backed up and kept over 100 million files safe and secure since we launched. I am thrilled with the response and the feedback we’ve been getting from our clients. 6/BR: Can you tell us about your servers, please? Where they are located, how many backups you perform, if server room is controlled for humidity, temperature, and whether there is backup power? Servers are located across North America for data redundancy, so if something happens to Site A, Site B and C will maintain services, keeping our client’s data bank-vault safe. Exacep uses top tier best-in-class storage and application servers. Application servers are virtualized and clustered for maximum uptime, performance and reliability. Enterprise storage servers allow for quick expansion, local and network raid ensuring high availability without a single point of failure. 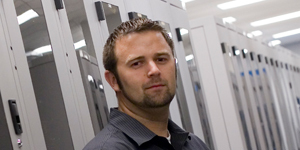 Data centers are carefully chosen based on features and not on price. Last years uptime of Exacep’s services was greater than 99.999%. 7/BR: What makes your company and its service different from others? We’ve really been focused on services for people that are looking to secure data that absolutely can’t be lost under any circumstances. For example, many of our clients are doctors so if they lose their data, such as patient records, the results can be catastrophic in a very real sense. So, Exacep not only protects our clients, it protects our clients’ clients as well. We have really focused on providing a fair value for our service which means we’ve appealed to many small and medium sized businesses who can’t afford to deal with a one-price-fits-all kind of company. We offer a managed approach to our clients so we actively monitor scheduled backups and head off any issues far before they have a chance to turn into problems. We also give our customers the option of reporting so they can see a usage summary of their backups on a monthly, quarterly or yearly basis. In terms of security, we offer NIST approved AES -256 (Rijndael’s implementation) with 2048 RSA generating cipher, compared to many of our competitors who use traditional Blowfish or 2 fish encryption algorithms. In terms of speed, by focusing on file transfer utilization, our clients can quickly and efficiently backup files from anywhere in the world, and we are still able to offer very competitive pricing. 8/BR: What kind of growth rate have you been experiencing? And what is your expected growth rate for the next few years? At this point, our growth rate has been around 110% over the last six months, and we’re projecting 400% over the next two years as our dedicated market strategy is currently being deployed. As I already said, there are many favourable market conditions at the moment, such as the paperless mandate I spoke of, and some others I’d rather play close to the chest right now. But, I believe our numbers projected are not overly optimistic. 9/BR: What have been your greatest challenges so far and what do you see these challenges are / will be at the present time / in the coming years? How do you plan to overcome those challenges? Working on time management because of our rapid growth and gaining further market share through branding and marketing activities. At the moment, we have a very strong team, I’m a big believer in hiring and retaining the best people. To really get to where we want to be is going to involve building a talented group over the medium and long term who can deal with the demands we’ll certainly be under. In the future, if all keeps going as it has been, and I believe it will, we’ll be in a position to deal with these problems. But in business, being busy is the type of problem you want to have. 10/BR: And what are your biggest accomplishments so far? Well for me, the biggest accomplishment isn’t so much the increase in business we’ve experienced; it’s actually the great reviews we’ve been getting from our clients as well as the positive feedback Exacep has seen from several independent online backup professionals. It’s wonderful that our clients see the value in our product but when you also get positive reviews from professionals in the industry that really validates all of our effort and what we’ve been trying to do here. In terms of technical accomplishments, Exacep was the first online backup company to integrate volume shadow copy in the .net environment in the offsite backup market. That took a huge amount of work and we overcame a ton of challenges, but it was worth it when we received accreditation from both the Canadian government as well as Microsoft. 11/BR: What are your top selling account packages, and why are they enjoying so much success? Our most successful backup package to this point has been our 10GB backup option. It has really found a market because it allows small and medium sized businesses to protect their important data for a very reasonable price. When companies do a cursory cost benefit analysis, it becomes clear to them that it’s well worth it to choose us. Officially, we sell data protection services, but what we really deal in is peace of mind for our clients. 12/BR: Are there any new products/services you are developing that will soon be available? We’re going to be offering a managed approach to our clients. This will help them monitor and identify their backup statistics on a quarterly basis. We’ll be providing them simple-to-understand information they’ll be able to use for their own information and backup planning. Our managed approach is going to be one of our value-added offerings that sets us apart and simplifies the whole online backup process for our clients. That’s what we’re really about, offering simplicity to our client base which is overwhelmingly not of a technical mindset. Another exciting development at Exacep is that we are also in the initial stages of providing a Mac/Linux client to reach a whole new market. 13/BR: Do you charge by account or by PC? Do you offer unlimited backup and restore? Exacep charges by storage amount in packages starting at 1.5GB all the way up to 200GB. Each of these packages can have one or multiple PCs backup data using the storage package purchased. Once again, we’re all about simplicity and we aren’t looking to squeeze every last penny out of our clients at the expense of our service. I think people are fed up with being charged for absolutely every little thing and we’re going to avoid that. We’d much rather our clients be happy and stick with Exacep than us making a few more dollars and seeing them leave. We do offer customized packages as we know different clients have different needs and expectations and it’s our job to tailor our product to fit them rather than our clients having to adjust themselves to our product. At the moment, we do not offer an unlimited backup package but it’s a concept we’re thinking about. 14/BR: One of the biggest concerns of online backup users is data security and privacy. How have you addressed those issues? Our system allows for private key and a system-managed key for backing up data. We let customers know at the beginning of the relationship that we cannot recover a lost private key and suggest if they use this method, they print a copy and place it somewhere safe. They have complete control over the security of their own data and as I said above, our algorithm is extremely complex, making it one of the safest options on the market. In the event a user selects a system managed key, nothing is ever left directly on their computer for an added level of protection for our clients. We try to give our clients the best of both worlds, absolute security and total privacy. Exacep is not interested in data in and of itself, we’re interested in keeping data safe and there’s a big difference between the two. 15/BR: How does your proprietary technology compare to the proprietary technology of your main competitors? Exacep does offer a concrete and demonstrable competitive edge in file transmission and encryption. While most of our competitors use http or ftp for file transmission our transports offers a 10% speed advantage over ftp or http which allows customers backups to complete faster. We are also in the process of integrating a bit level filter driver which will offer significant advantages over our competition. While benchmarking file transmission Exacep on average offers a 10-25% increase on file transmission which is expected to increase even more in the next few months. 16/BR: What are the key competing technologies in the online backup industry and what are some of the advantages you offer over the competition? Key technologies in online backup are simple. Your offering must be completely automated from beginning to end and from one individual stage of the backup process to the next. To make this possible, we’re required to have the ability to copy a file or database that’s in use (volume shadow copy) an NIST approved encryption algorithm (Rinjdaels implementation of AES) firewall friendly efficient transmission protocol (ftp is acceptable but doesn’t work well over higher latency or distances) and managed reporting to create a pro-active approach to backup. The major advantage we provide to our clients is that in every stage of our business we implement best in class solutions. Our focus isn’t on cutting upfront cost for us or looking for shortcuts that will make things easier for us here at Exacep, we’re looking to create the best service for our clients. End of story. A major edge we have over our competitors is, when we say we are interested in offering the best online backup service we actually mean it. This translates into listening to client feedback and adjusting our company to meet their needs. Clients requirements aren’t static, they change and therefore, we have to change also. 17/BR: Does your solution take into consideration compatibility across the major platforms, mobility, flexibility and constant access to data? Exacep currently supports all Microsoft operating systems of Windows XP and greater including x64. While Windows 2000 Pro and Server are also supported, they lack the ability to create a snapshot of a file or database in use. As I said above, we’re currently in the product development stage for a platform that supports Mac and Linux users. 18/BR: How has the online backup business evolved in the past few years, and how do you see it further evolving? Online backup has grown considerably over the past two years. Both in numbers of users and people who are familiar with this sort of technology. There are still many companies that create the technology and sell the service to larger companies, the signs definitely point to considerable growth in the marketplace not only in the short term, but for the foreseeable future as well. If there is anything that I would say has to improve, it isn’t necessarily the offsite backup technology, but rather the upload capabilities offered by Internet service providers. Until this is addressed, the full potential of online backup won’t be possible. When an initial backup takes days, there really is an increased possibility for error. Once we’re able to see this reduced to hours, minutes or even seconds, the absolute potential of online backup will be realized. 19/BR: Whom do you consider your main competitors? And Why? The market leaders, and most recognized names in offsite backup at the moment seem to be Mozy and Carbonite. Many of their clients are what we’ll call the residential market, people storing personal files such as pictures and the like. I do believe that there is no single leader in the SMB marketplace and the possibility of capturing a substantial share of business, not only here in North America, but world wide is still there. And we’re going for it. 20/BR: Large companies like Microsoft and Google have started to offer online storage solutions. Do you fear them? How can you compete with such formidable adversaries? While I think it would be very foolish for any business to ignore Google or Microsoft, I feel Exacep offers significant advantages when compared with these two giants. Google and Microsoft have the ability to work from massive resources and across numerous divisions. But the problem they’ll face, and anyone who’s worked in a corporate environment will probably agree, is communication breakdowns are much more likely across a massive company. Therefore, even if an initial product is successful from a technological standpoint, they’ll really lose the personal and proactive approach that potential customers love to see. Also, because they are so well-known, any serious problems will be translated across the world in no time at all and cause significant harm to their reputation as an online backup provider. An example of this is Microsoft’s Vista platform, I don’t think I have to go into detail, and that’s exactly what I’m talking about. Exacep is confident in our product, and just as confident in our personal approach to our clients. Word of mouth can be one of the most influential factors in success or failure and to this point we are very happy with the way people are talking about our company. 21/BR: In the next two years or so, what new developments do you expect to see in the online backup and data storage industry? Storage costs are going to decrease. This is not a guess, if you look at any technology, costs go down over time. For the manufacturer, the provider and of course, the consumer. This will hold true for online backup technology as well. Another pattern we’ve been seeing for the past few years is an increase in Internet transmission speeds. With a decreasing cost of storage and faster Internet transmission speeds I believe that online backup will start to become more of a synchronous service as opposed to asynchronous. With obvious benefits for the consumer to follow. 22/BR: In the future, say five years from now, do you think the cost of online storage will remain as it is today, or will it go significantly cheaper? For example, to back up a 1 GB file? Well, the answer is simple but there’s a bit more to it than yes or no. The costs of storage will undoubtedly drop, but at the same time, the needs of the user will almost surely grow. Every 18 month’s hard drive sizes double, that’s not a guess, that’s a pattern of the previous 5 years. So, I do think that in five years you’ll see the cost of storage reduce dramatically, but at the same time, because of advances in technology and the corresponding evolution of user requirements, I don’t believe offsite storage packages will begin at 1GB in five years. 23/BR: In the past few years, many small companies and even some banks, such as Wells Fargo, have started offering online backup solutions? Do you think that the online backup market is getting crowded? What do you have to do to stand out of the crowd? Just look at any business, once it catches on, a lot of companies enter the market looking for a piece of the pie. As long as you’re able to offer something that’s going to appeal to a segment of the market, you should be fine. I’m confident that Exacep is going to appeal to multiple segments for different reasons. Listen, there’s reportedly over 1 Billion computers in the world today, that leaves a lot of clients for everyone. 24/BR: Any advice for IT companies planning to launch an online data backup and storage business? There are two main things I would advise, make sure you are able to offer technology that is best-in-class in terms of features and efficiencies and make sure you have the capital to deploy your technology. There are a lot of companies, certainly not only in the online backup field, that have created the hype to attract clients, but haven’t created the service to keep them. Be sure you can follow through on the promises you make to you clients or you’ll see them heading for the door pretty quickly. 25/BR: On a personal note, tell us about your life: married or single, children, your hobbies, where you were born and grew up, where you got your education, where you get your inspiration, and whether you will be around in this business, say 5 years from now? I was born in the Niagara region in Ontario Canada, approximately 15 minutes from Niagara Falls. By the age of 18, I was on my way to IT excellence holding various certifications and accreditations. Being from Canada, I am a huge hockey fan and attend/participate in as many games as possible. I spent free time either with friends, family or furthering my knowledge in an ever-changing technology marketplace. We sincerely thank Scott for allowing us to interview him.